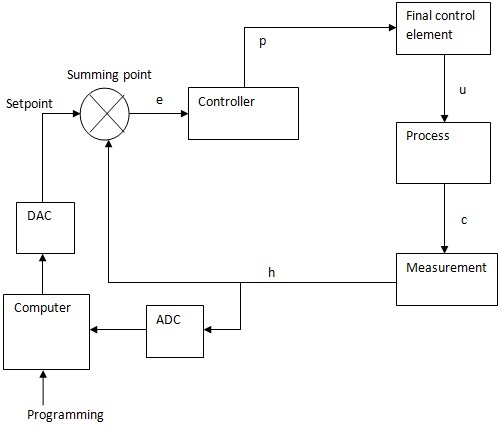 Implementation of the Process-Control Loop using a Computer in a Supervisory Capacity. The expression supervisory digital control is used to describe a situation in which digital techniques are employed to supervise analog control loops. Generally, in these cases, a computer is employed to adjust the setpoint of an analog controller. This approach is employed to take advantage of the well-known ad trusted performance of analog control, while at the same time using the various advantages of computer supervision. In particular, the computer can examine many variables and solve complicated control equations to determine and then set optimum set points of several analog loops. This is particularly important when interaction exists between variables, such as changing the temperature set point and causing the pressure to vary. The block diagram of a supervisory system is shown in figure. In general, the logic or computer supervisor will input the measured quantity and programming and output a calculated set point. In the analog loop described, a hybrid conversion could be developed by using ADCs and DACs to provide temperature input and reference voltage output to analog loop.